I was asked on the weekend if I have any made cakes recently and I said no I haven’t. The person said “what, you’ve had no birthdays?”. Lord, give me strength! I have been working and this person has been told I have been working hard! I am not working the 60 odd hours a week I used to, but I have been working half of that, plus trying to fit in sleeping, socialising and cake decorating class. I do not seem to be getting enough sleep nor seeing everyone I would like to! And yes housekeeping and cooking are being neglected again! Thankfully the puppies don’t mind, and the hubbie only gets grumpy if he can’t find socks & jocks! I am just trying to fit in as much as I can, without doing too much. I have actually said no to a couple of cakes recently and also had to make the decision not to enter anything into the Wanneroo Show this year, even though there was a new category for cake decorating students & novices. I am so disappointed I can’t enter a cake in the show, but I am slowly learning to say no to things. I do have a couple of cakes coming up (yes two birthdays for two special kids that I do not want to disappoint, and I love the themes they have chosen!) and also I am in the middle of a felting project that an Aunty asked me to make. So since the Wanneroo Show is in 8 days time, I thought I would share the last of the entries I put in last year. I have previously written about the Special Occasion Cake, Christmas Cake and the flower photographs. I also entered two cakes for tasting! I made the Rich Fruit cake per their recipe – OMG it was so annoying chopping all the fruit and nuts per the recipe – “To ensure uniformity and depending upon the size it is suggested the raisins be snipped into two or three pieces; Cherries into four to six pieces and Almonds crosswise into three to four pieces.” I also made my first boiled fruit cake, that turned out pretty good, but probably had a little too much ginger in it for my liking. I also prefer my recipe for fruit cake, than theirs! hehe As you can tell I didn’t win for those entries. I also entered a piece in the sugar art category. As I may have said in my previous blogs, I was mislead about the quality of art entered into the show. I also over-committed myself and didn’t leave enough time for my sugar art piece. My piece is an elf, but I just wanted to do so much more. I entered it anyway and worked out pretty quickly that I was way out of my league when the lady ticking off the entries asked if it was a child’s entry. The same lady also let out a deep sigh when I came in the third time with the last of my entries and said “you have more” – gee I am sorry for supporting the community show! I can’t find the note the judge wrote about my piece, but she was nice and brief and said something along of the lines of “Thank you, a fun entry”. Not much more needed to be said after seeing the other pieces! So here is some of the sugar art I was up against. I particularly like Narnia scene. The pieces that won first and second were AMAZING! I also entered some photography in the Animals – Domestic and also Animals – Non-Domestic. The domestic photos were of my Mum’s Westie Daisy, and also the photo of Makita’s paws. I liked the photo that came second of the cat lying on its back. The lightning is great as it just has feeling of farm colours, and the photo is sharp. But the shot of the dog’s head apparently won first prize. I am sorry, it is a nice dog and all, but I do not know how it is a great photo? I have included a snapshot of all of the entries for you to make own decision. I think quite a few others are much better, I guess I just do not know what they were looking for. My non-domestic animals were of my five drinking zebras and the colourful lizard. Both of which I took in Tanzania and I am super happy with the zebras shot. I was whispering to the zebras from about 500m telling them to put all their heads down at once! It worked! I love the shot of the frog that won first prize. I also wanted to s hare one more photo from the humorous category. I saw it when I was delivering my photos and thought it was fantastic. I am so glad it won its category! I hope this years Wanneroo Show is a huge success, especially since my friend works very hard on her areas. Oh, and this is how Hamlet interjected himself between my legs on the end of the recliner while I wrote this blog! I do not consider my dog a pet. My dog is family. I am not sure who said that, but they are so correct! A year ago on 16th November 2012 Makita passed away. I am sure everyone reacts differently to death. A little of me went away with Makita that day, and I hope I don’t forget how much I loved her and how good she was. She was our cuddly teddy-bear, our exerciser, our hot water bottle, our puppy! On the 6th January 2003 we packed up the car and left just enough room for Makita in the back seat – she had just over a seat to herself! We were heading to Kalgoorlie! I still feel bad to this day about how little room she had for the next 6.5 hours, but she curled up after a while and slept most of the way. Makita settled in straight away in her new house and new town. We rented for six months and once I had a job and we knew that we’d be in Kalgoorlie for a few years then we moved into our own place. I have been trying to work out how to describe Makita’s life while we were in Kalgoorlie. Both hubbie and I worked pretty hard. I worked a lot of weekends and hubbie even umpired AFL (footy) or played cricket, depending on the season, on the weekends. So Makita’s life was trying to keep cool in the house during the day, us home for dinner and then “walkies” around the dimly lit streets of Kalgoorlie at night. Below on the left is Makita working with me and on the right is Makita watching the footy with hubbie – hubbie even taught her how to “high-five” when our team got a goal! Just imagine an excited higher version of “paw”! We often took trips back to Perth, but it was too far away to take Makita, so she often had puppy-sitters. One of the reasons why we needed puppy-sitters and couldn’t put her in a kennel was because she thought she was a human – well at least she didn’t like other dogs, kids nor strange big men! I often said I must have taught her well! hehe But she may also have been a bit of a devil – check her eyes out! Luckily there were lots of available puppy-sitters in Kalgoorlie as people often went away for weekends and I used to return the favour and look after their pets (Monty & Zephyr the cats and hermit crabs were my favourite!! ). Sam (and yes the same one that puppy-sat Makita in Rockingham) moved to Kalgoorlie. She happened to move to Kalgoorlie a few days before we went on holidays! So Sam got to puppy-sit once more. Unfortunately there was a thunderstorm one night and Makita didn’t let Sam sleep on iota! Makita did not like thunderstorms at all and she didn’t until her last days. We are not sure if she was scared, or if she just wanted to grab the thunder and lightning and shake them until they went limp! Once during a thunderstorm in Kalgoorlie we were out in the front garden and Makita charged at the lightning – hence our assumption that she wanted to “get” it! Our friends Brad and Sam (a different Sam!) house-sat for us. Now Brad isn’t much of a dog person and Sam is pretty small and Makita was pretty big. So they didn’t interact with Makita much and Makita decided she wouldn’t eat! We had a couple of texts from them and then another friend Ruth, who had puppy-sat Makita a few times too, went over and told Makita it was okay. Ruth had to stand with Makita while she ate, and she did and all was okay after that! Once again, the poor thing! I also feel terrible that we didn’t spend 5 Christmas Days with Makita But we left presents for her puppy-sitters to give her. For the first year we caved and gave her a rope toy while I was finishing wrapping the Christmas presents – she loved it! She loved all her toys, even though all of them ended up being destroyed! Toys weren’t the only thing Makita destroyed, she also liked to scratch and dig on her canvas bed. I swear for 5 birthdays in a row her present was a new canvas cover! And I am so thankful that we got a photo of her “in” her bed! Now time for some more shaming. For those of you that may not know where Kalgoorlie is, well it is 600km inland in Western Australia. Being so far inland means the soil is red. So here a couple of shots when Makita turned red! And also a shot of her in the hole for our new pool – a much bigger hole than those Makita-Bin-Laden ones from Rockingham days! Early 2008 hubbie and I left Kalgoorlie, but not without having one last party! We had accumulated a lot of alcohol over the years and wanted everyone to try to help us drink it so we didn’t have to cart it back to Perth! Here is hubbie and Makita the day after the party! And I cannot end Makita’s Kalgoorlie story without mentioning a new friend called Jannine. Jannine was our saviour during our last weeks of living in Kalgoorlie. Our Kalgoorlie house settled on 30th January 2008, but our new house in Perth wasn’t finished yet! Hubbie spent a few weeks in Perth hurrying up the builders and Jannine was just wonderful and let Makita and I (and hubbie) crash at her house. Jannine also looked after Makita for a night when I had to go to Perth for a funeral. They were a few crazy weeks, but Jannine saved the day! Makita left a good impression on Jannine and Scoobs was welcomed into Jannine’s life not long after!! Here I will leave you with a smiling Makita and you’ll have to wait a little while for the last chapter of Makita’s life (and be warned I got my SLR during this chapter and Makita was my model!). Don’t you just love happy puppies? 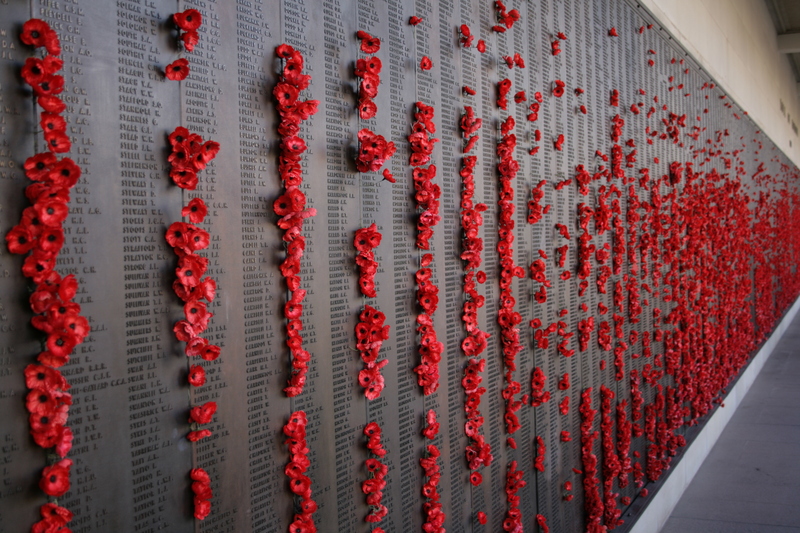 At the eleventh hour of the eleventh day of the eleventh month we have always given pause to reflect about those who fought for our Commonwealth. It was probably three weeks ago I first really thought of today for a while. About that Roller Coaster Week I had a year ago. We were sitting in the spa (I have been getting hubbie and myself to go in the spa at least every second day as we have been working day and night and I am forcing us to relax! There are no electronics in the spa!! ), and my two naughty puppies were foraging where we have buried Makita’s ashes. I realised she had been gone for nearly a year and then the whole week came back, beginning with Granddad’s passing on Remembrance Day 2012. It is so poignant that Granddad passed away on Remembrance Day. I guess we are very lucky that we are here to today and we had a Granddad like him. When I think about the soldiers that fought for their country, I always think of Granddad and some of the stories he told us about being a POW. Granddad was in the Durham Light Infantry in WWII. He was wounded in France and sent to a French hospital awaiting his return to England. The day before he was supposed to be transferred the town was overrun by the German Army and he spent the next 5 years in Prisoner of War labour camps across Europe. It is the only first account experience I have heard. They are the most real war moments for me, the rest are what I have read, seen on the news or in movies. I guess once again that I am so lucky they are the only accounts I know personally. An eerie thing occurred last year, a commemorative Australian $2 coin was produced for Remembrance Day – “a solemnly beautiful symbol of those who fought and died in all wars and conflicts”. My middle sister saw one first and saved a coin each for us three sisters. Can you believe I have a coin that marks my Granddad’s death? A coin so relevant to my Granddad. In July I attended a cake decorating course for frilling. I didn’t know what it was but it sounded fun! I had to take a two tier cake – 6 inch and a 8 inch. The week after the cake decorating course there was a family get-together, so I thought I would make a fruit cake and take my piece of art (tongue in cheek) to the gathering. It turns out frilling is like ruffles! There were only 3 of us taking the course and it was so much fun. The 4 or so hours just disappeared. I enjoy that part of cake decorating, you are taken away from the “real” world and you are creating! One lady had dummy cakes, so she was just practicing. The other lady was decorating the cake for Mum’s birthday the next day. I didn’t say anything at first and then finally I said that my cake was going to be eaten at a family gathering after spreading my grandparents ashes. My Nanna passed away in 1995, 6 weeks before their 50th wedding anniversary. Granddad was distraught but showed a brave face for the many years he was without her. He kept her ashes on the mantelpiece and towards the end he mentioned how it was time he was back with Lily. In July we spread their ashes at Burns Beach, so they could stay here in Australia if they wanted to, or they could travel back home to England. I like to believe there is some of them both here and in England. So I hope everyone paused today and thought about all that fought for us so we could be here today. Many tributes to my Granddad were put up on Facebook today by my extended family. It was so beautiful to see. I especially loved the collection of photos my middle sister put up of Granddad over the years. And even more posts about Remembrance Day were posted by family and friends alike. Just beautiful to see.